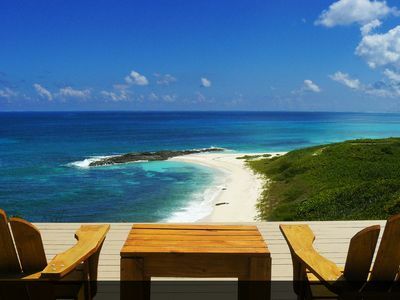 Unique beachfront property with the most extraordinary views in the Bahamas! Please read the entire description so you understand our property, the villa sleeping arrangements (optional apartment) and what we offer. 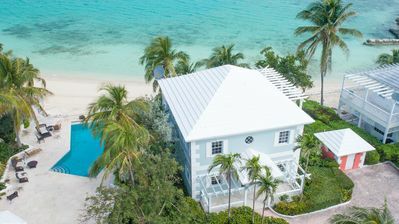 Eleuthera Villa is a fantastic elevated beachfront setting like, “Something out of the movie Castaway in the South Pacific,” is how one vacationing family described the setting and we could not have said it any better. Most people do not realize the Fiji style elevations in some parts of the island. There are many different incredible elevated views from the property that inspired that comment and we show a few of them in the photos section of our listing here. There is a really cool private Gilligan's Island type tropical trail that snakes its way through the lush foliage down to the beach. Also a private little bench sitting area that literally hangs over the ocean. 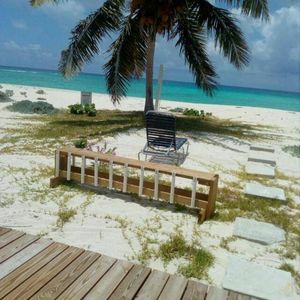 Couple that with a stunning vantage point and a world class beach located right at the property and you have one of the premier rentals on Eleuthera. 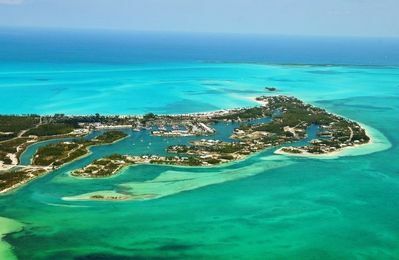 Nowhere on the entire island (or any Bahamian island) is there such a breathtaking vista as what we have. Most people walk up on to our upper deck for the first time and just stand there in awe for a few moments before realizing the rare beauty of the place. 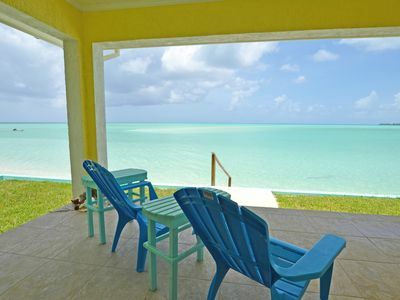 Even many of the local Bahamians we know are stunned by the view. The different shades of color in the ocean you see from our deck are truly mesmerizing and seem more like a painting than real life. If you are into Yoga there may be no better place on Earth than our upper deck to do your thing. It's also not a bad spot to enjoy the morning coffee at sunrise and a cocktail at sunset! That is my son and me in the sunrise photo of the upper deck during vacatgion recently. The air conditioned villa was completed in early 2017. The main house has three bedrooms (one bedroom is a loft) with one queen bed in each bedroom and two queen beds in the loft. 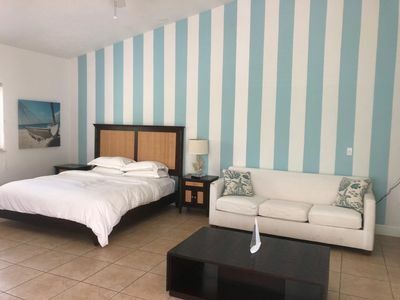 Plus there is an optional air conditioned apartment with one queen bed which brings the property total to four bedrooms and five queen beds if you choose to add the apartment. The apartment costs $595 per week when added to the main house. You will find beautiful craftsmanship and wood work with nautical ceilings fans and 16 foot high open beam vaulted ceilings throughout. The home has everything you need for a comfortable stay. The large open style kitchen is well equipped for cooking at home. There is an outdoor grill as well for your fresh fish, conch and lobsters. There is a dining table and center island bar area for seating eight people. We have large comfy Queen size beds with excellent mattresses, wicker living room furniture consists of a full size couch, 2 chairs and a coffee table all in a tasteful island style tropical decor. The villa is bright and open and because of the elevation it gets nice trade winds which means cools temperatures at night and fewer insects. There is a great view from every room whether it be the aquamarine shades of the ocean to the east or the deep green hillside to the west with its magnificent sunsets. We have multiple decks to enjoy. Most are open to the sun and two are covered if you wish to get some shade. The deck space combined is for over 1000 square feet of outside living space with a lot of deck furniture. 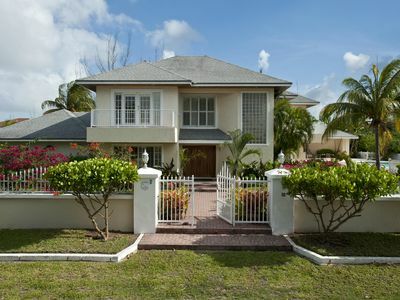 The Villa is a very soothing and inviting place to return home to after a hot sun drenched day at the beach. 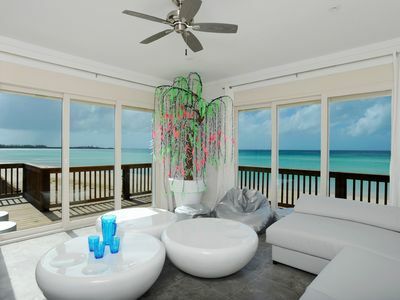 There is an outdoor shower with hot and cold water on the back deck for bathing under the stars at night if you choose. 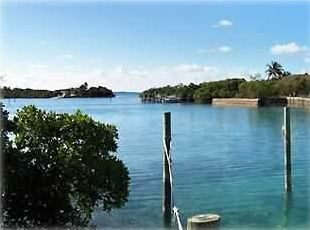 The grounds are landscaped with Bermuda style golf course grass, numerous coconut palm trees and stone walls. For nature lovers one of the neat things we get to enjoy is the government owned jungle nature preserve that borders our property. It is filled with lush foliage, birds and wildlife. We have a resident (pet) bird called a Yellow Crowned Night Heron who usually hangs out on our decks. At quiet times of the day you can listen to the music of numerous bird species, including many humming dirds, talking to each other. You also get to see both amazing sunrises and sunsets from the property due to the elevation and its position. 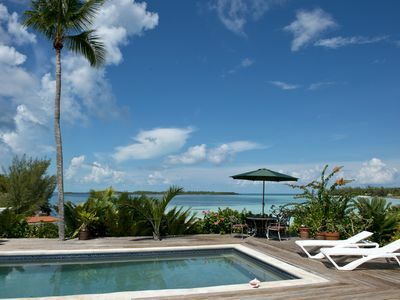 The setting is very peaceful, private and unique in that we have the jungle and the beach in the same place! 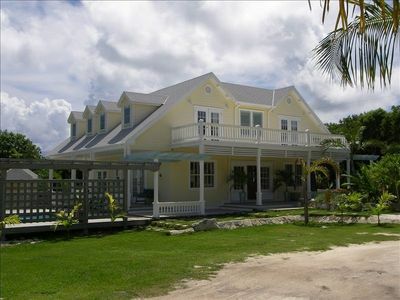 Eleuthera Villa and the attached apartment are the main living structures of the property. It is located way up the main driveway about 300 feet from the road along the top of the ridgeline over looking the ocean. We have a guest cottage called The Jungle Cottage which is set down lower on the property nestled into the jungle. 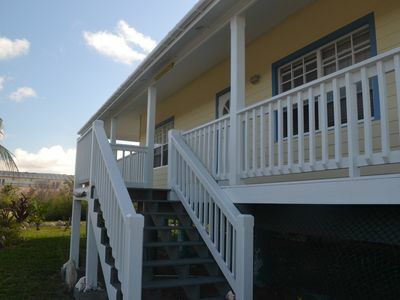 The cottage and villa are completely separate and have their own driveways and boardwalk entrances. 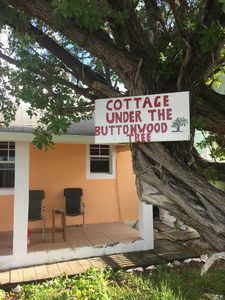 The guest cottage has it's own trail to the beach which connects to the main trail. We have one neighbor to our north and no immediate neighbors to the west or south. The ocean is to the east. 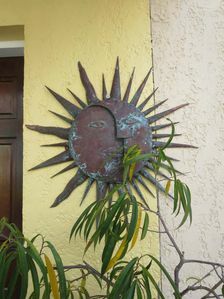 If you wish to inquire about renting the guest cottage out in conjunction with the main Villa and apartment just ask. You can access the internet with use of your cell phone, but there is no traditional Wi-Fi. Let us explain in detail; If just checking emails and general internet browsing is your goal you should be able to work it out. What we do is turn "data roaming" on with T-Mobile which is our cell phone carrier. Sometimes we get a decent signal in the villa 1 – 3 bars and other times we must walk outside on the decks in search for a good spot with a better signal. Internet signals on the island are notoriously inconsistent so be ready to have some patience. Also when you hit Commonage Road just a half mile from our cottage the signal is pretty consistent for us, as are most towns. While driving on the main Queens Highway most parts have signals for internet near each town. Check with your carrier to be sure prior to your trip what options you have. Some people rent local cell phones or change out SIM cards for local ones on the island, etc. 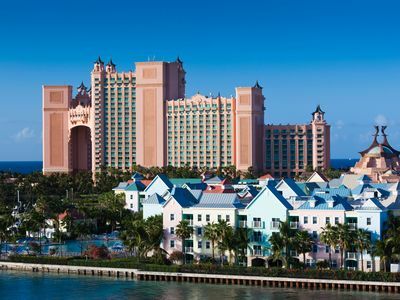 You can also contract BTC which is Bahamas Telephone Company for further information. Many places offer FREE traditional Wi-Fi just 2 miles away in Gregory Town, for example, Unca Gene’s Bar and Restaurant is one spot. If you have further question about this topic just ask. Thanks. 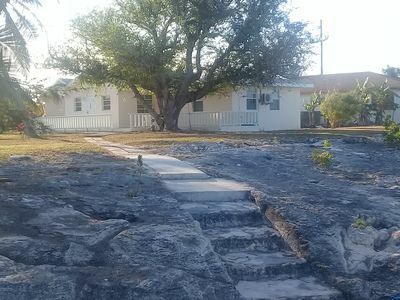 As far as location goes we are just 2 miles from Gregory Town with lots to do from restaurants and bars to adventure trips and exploring caves, blue holes and everything in between. Plus all the stuff you need like grocery stores, gas stations and liquor stores are all nearby. 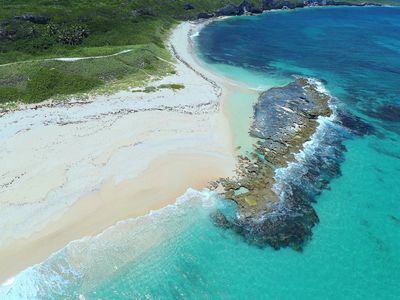 The beaches in this part of the island are numerous, stunning and usually empty. 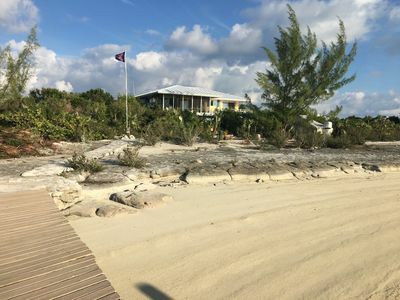 We are conveniently located between the North Eleuthera and Governor's Harbor airports (each about 25 minutes away) and we can arrange to have a special discounted rental Jeep/SUV waiting for you at the airport when you arrive to make things easy and to save on a taxi expense. You can drop off the rental car at the airport when you leave for added convenience. 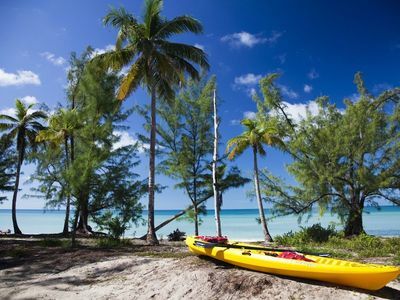 We are extremely knowledgeable about Eleuthera having come here for decades and will be sure to help you plan your trip to our island paradise. 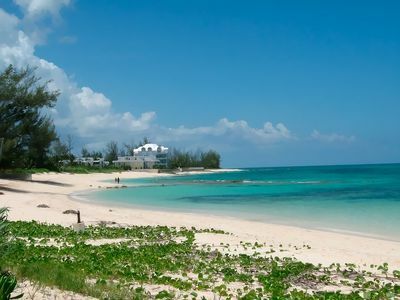 Lastly we send out a 15 page awesome trip planner document that will answer any questions you have and tell you what you need to know about trip preparations and what to do when you get to beautiful Eleuthera!!! 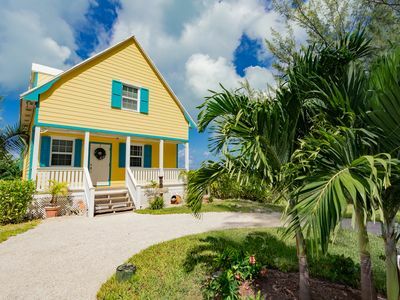 Villa del Sol - charming, beautiful villa set in a lush tropical setting.